Here it is the latest release of our recruitment component named NeoRecruit, correcting some minor bugs. correction of the recruiters select list in the offer form in frontend. If you're already using the component NeoRecruit, you can download this new release for free and in a few clics from your space "My orders" > "My files". Then, you will just have to upgrade your component from the back-office of your Joomla! website, in the same way as you were installing a new extension. 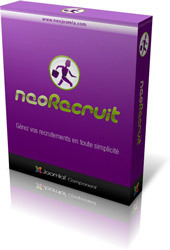 And if you're not yet using the component, you can download NeoRecruit here !